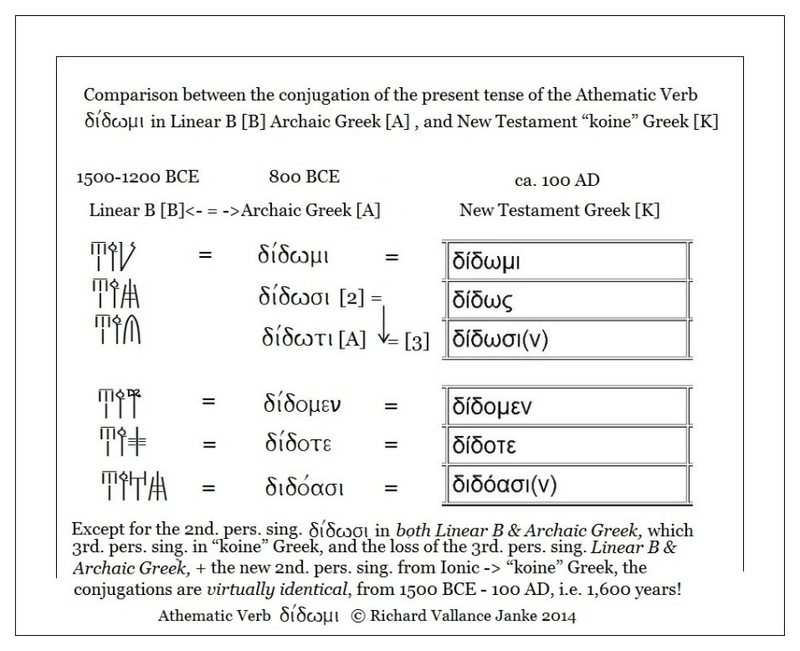 NOTE: It is crucial that you read all of the notes in this table in their entirety; otherwise, a sound grasp of the conjugation of the present participle, especially of the feminine singular, in Mycenaean Linear B will not make any sense whatsoever. The present participle active was all-pervasive and extremely common in both Mycenaean Linear B & in all subsequent ancient Greek dialects. It was heavily used to express continuous action in the present tense as well as accompaniment, i.e. to indicate that someone or something was with someone or something else. Thus, in Mycenaean Linear B, the phrase eo qasireu could mean either “being an overlord” or “with an overlord”, just as in Attic Greek eon basileus could mean either “being king” or “with the king”. As I have pointed out in the table above, the word qasireu never meant “king” in Mycenaean Linear B, since king was always wanaka. The qasireu was a lower ranking supernumerary, something equivalent to an overlord or baron. Another point which we simply must keep uppermost in mind is the fact that digamma (pronounced something like “wau” or “vau”, was extremely common in both Mycenaean Linear B and its kissing cousin dialect, Arcado-Cypriot Linear C, only falling permanently out of use in ancient Greek after the decline of these two dialects (Linear B, ca. 1600-1200 BCE & Linear C, ca. 1100-400 BCE). As is clearly attested by the table above, the feminine singular form of the present participle active, which was characterized by the all-pervasive presence of digamma in Mycenaean Linear B & in Arcado-Cypriot Linear C, had completely shed digamma even as early as the artificial amalgam, Homeric Epic Greek, even though digamma was still pronounced in the Iliad. If you are wondering why I have deliberately zeroed in on Book II, the Catalogue of Ships of Homer’s Iliad, as I am sure you are, wonder no more. Only Book  II alone, the Catalogue of Ships of Homer’s Iliad, can provide us with sufficient examples of Homeric grammar with distinctly Mycenaean characteristics, from which we can thereby retrogressively extrapolate numerous examples of grammatical forms in many of the major categories of Homeric Greek to their putative, and in fact, actual, Mycenaean ancestral roots. is a superb source for the study of ancient Greek grammar. 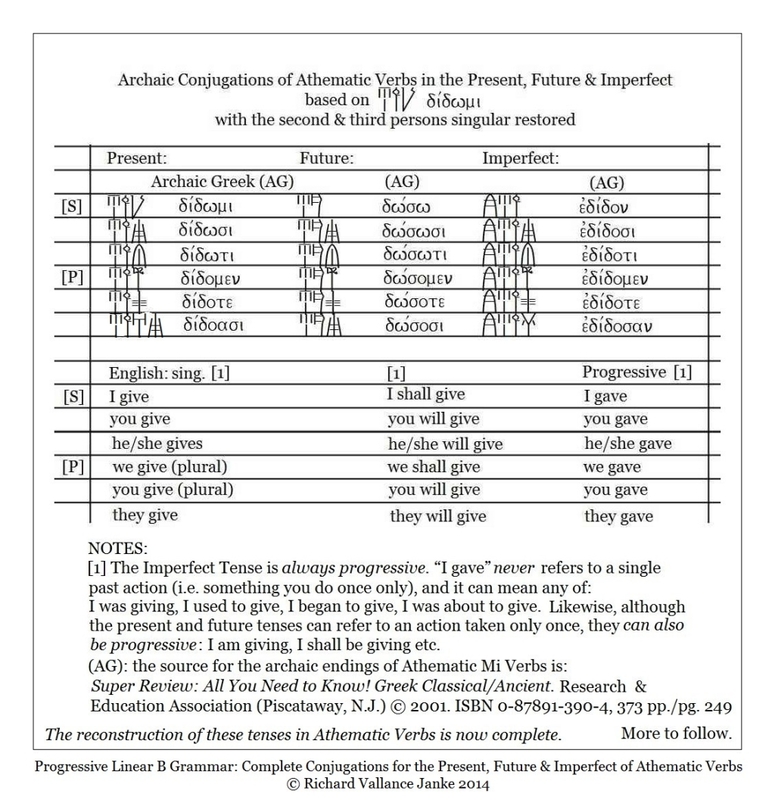 The link is parsed into the major sub-categories of ancient Greek grammar, i.e. nouns, verbs, participles etc. etc., and is thus an extremely valuable and highly practical source for ancient Greek grammar, all but eliminating the necessity of having to buy a hard-copy or e-book publication on ancient Greek grammar. In short, it is a perfectly sound source for ancient Greek grammar aficionados. The following table clearly illustrates that the most archaic of ancient Greek verbs, namely, athematic verbs in MI, underwent only barely perceptible changes over a span of 1,700 years. This is because these verb forms were already fully developed even as early as in the Mycenaean Greek dialect, written in Linear B (ca. 1600-1200 BCE). This phenomenon falls under the purview of diachronic historical linguistics, whereby the term diachronic means “linguistic change or lack of it over an extended period of time”. The importance of the minimal changeability of archaic athematic MI verbs cannot be over stressed. Regardless of the period and of any particular dialect of ancient East Greek (early: Mycenaean and Arcado-Cypriot, middle: Homeric Epic, an amalgam of various dialects, Classical: Ionic & Attic) & late (Hellenistic & Koine Greek), very little change occurred. In fact, only the second & third person singular underwent any change at all. In Mycenaean Greek alone, the second person singular was didosi & the third person singular was didoti. In all subsequent dialects, the form of the 2nd. person singular became that for the third, while the second person singular itself morphed into didos in all ancient East Greek dialects pursuant to Mycenaean. This was the one and only change the conjugation of the present tense of archaic athematic verbs such as didomi underwent diachronically from 1,600 BCE to 100 AD. The verb didomi effectively serves as the template for the conjugation of the present active of all athematic verbs in MI throughout this historical period. This is just one notable aspect of progressive (D) derived Linear B grammar. There are many others, which of course we shall address in the gradual reconstruction of ancient Mycenaean Greek grammar over the next few months. I myself will be translating the entire Catalogue of Ships in Book II of the Iliad, in which we find the most archaic Greek in the entire Iliad. It is therefore of utmost significance in the confirmation of Attested (A) vocabulary, found on any and all Linear B tablets discovered to date, and in the restoration of Derived (D) Mycenaean Greek vocabulary, nowhere Attested (A). LEXICONS & GLOSSARIES: At the moment, there are only two Linear B lexicons of any note on the Internet, (a) The Mycenaean (Linear B) – ENGLISH Glossary, which although useful is extremely unreliable, riddled as it is with over 25 errors in the Mycenaean Linear B entries alone, and with at least 100 more errors in either ancient Greek or English. Students of Linear B should use this glossary with the utmost of caution, as they are liable to make serious errors in deciphering or translating Linear B tablets, if they rely on it solely. Both are available in .PDF format on the Internet. If you must insist on using the first glossary (a), you should be certain to cross-check every single reference you find in it against the Lexicon (b). (c) We shall not, however, duplicate the excellent work Chris Tselentis has done with personal name & toponyms in his fine Linear B Lexicon, because to do so would simply be a waste. On the other hand, we shall include all major Minoan & Mycenaean personal names & toponyms which play a critical rôle in extant Linear B texts. MICHAEL VENTRIS: It goes without saying that I regard absolutely any information and research, original or new, relevant to my hero, Michael Ventris, as of critical importance. I hope you do so too. PROGRESSIVE LINEAR B: Progressive Linear B is a brand new Theory of Mycenaean Greek Grammar and Vocabulary in Linear B. 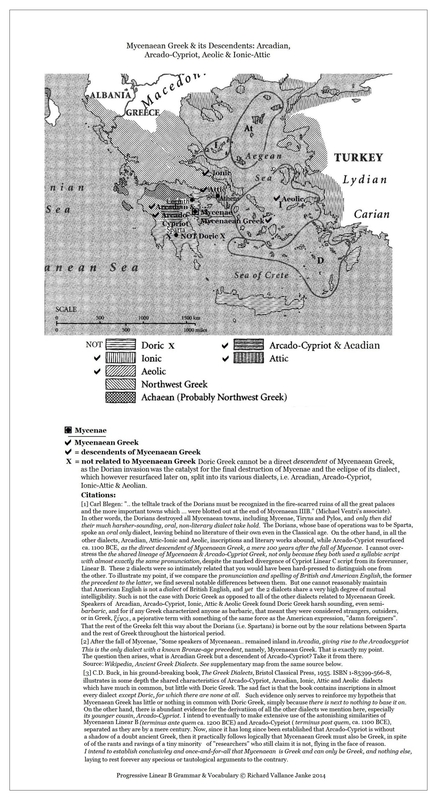 This theory enables me to reconstruct large swaths of Mycenaean Greek grammar and vocabulary, by means of the techniques of Regressive Analysis from later Greek textual resources, in the following order of relevance, highest to lowest: Arcado-Cypriot Linear C sources (that dialect being the closest cousin to Mycenaean Greek); The Catalogue of Ships in Book II of the Iliad (See Iliad above); the Iliad itself; and finally, all of the East Greek dialects other than Arcado-Cypriot related to Mycenaean Greek, the older dialects taking precedence over the later, in this approximate order: early Ionic, Aeolic, Ionic & Attic Greek. Having regressively extrapolated grammatical forms (conjugations, declensions, prepositions & adverbs, numerics etc.) from their latter-day equivalents in the aforementioned dialects, I shall then proceed to reconstruct as much of the corpus of Mycenaean Greek grammar as I safely can, within strict parameters based on equally strict criteria, which I shall of course detail in my Introduction to the grammar, whenever I am finally able to release it in.PDF format on the Internet (2017-2018). Naturally, the reconstruction of Mycenaean vocabulary in our new Lexicon first (2015-2016) and of the most complete Mycenean grammar ever seen to date (2017-2018) are both immense undertakings, so please do not hold either myself or Rita to account if we take longer to release them than we might have anticipated. This is so simply because we expect from ourselves only the finest quality. And you should expect the same, nothing less. SUPERSYLLABOGRAMS: Finally comes the biggest surprise of them all, an entirely new Theory of Linear B Supersyllababograms, which we seriously believe will prove to be a major breakthrough in the decipherment of much of the remaining 10 % of Linear B single syllabograms (i.e. where we find only 1 syllabogram all by itself written on a Linear B tablet, heretofore entirely resistant to decipherment). But as it turns out almost all of these single syllabograms, of which – get ready for this! - at least 31 of 61 Linear B syllabograms – are actually supersyllabograms. Trust me on this one, a supersyllabogram, as you shall all soon enough discover, is much more than a simple syllabogram. Moreover, the implications of the impact of sypersyllabograms on our understanding of just what (kind of syllabary) Linear B is are bound to be profound and wide-reaching. I would even venture to go so far as to claim that Supersyllabograms (SSYs) will represent the first major breakthrough in the decipherment of Linear B in the 64 years since Michael Ventris’ astonishing achievement in cracking Linear B with the decipherment of Linear B Tablet Pylos PY 641-1952 in that year (1952). And just to whet your appetite, I shall be posting the completely revised Linear B Syllabary (2014), which I myself recently posted on our blog and on the Internet, with all the Supersyllabograms highlighted in BOLD, but without letting you know what these Supersyllabograms actually mean... although you can already find out for yourself what they mean simply by reading all the posts under the Major Category, SUPERSYLLABOGRAMS. So go for it. More news on this exciting breakthrough in the next post, which you are going to have to read anyway, if you are a Linear B researcher or translator really, really serious about new, unexpected developments into the Linear B syllabary. As I just did in our previous post with a much larger vocabulary of the Cypriot dialect, from which I extracted as many putative or hypothetical Linear B concrete and semi-abstract words as I could, leaving purely abstract words aside (as they almost never appear in in Linear B in Mycenaean Greek), I am providing 20 hypothetical Linear B equivalents to everyone on our blog or on the Internet fascinated by the near intimate relationship between the Mycenaean and Arcado-Cypriot dialects, written in Linear B and C respectively, with a vocabulary in the Arcadian dialect, somewhat briefer than that I posted for the Cypriot. C.D. Buck’s comments pretty much speak for themselves. But it is extremely important to stress the very intimate relationship between Arcado-Cypriot Greek (being the natural conflagration of the Arcadian and Cypriot dialects into one almost seamless continuum) on the one hand to Aeolic and Attic-Ionic on the other, all of these dialects inclusive falling squarely within the orbit of East Greek, as we move chronologically forward in time. On the other hand, along the same timeline, only in reverse chronological order, we can confirm that (proto-)Arcadian and Mycenaean Greek also unquestionably belong to the same class of ancient Greek dialects, namely, the East Greek. This is precisely why I choose to term both Mycenaean and (proto-)Arcadian as proto-Ionic, since that is in fact what these dialects were. “The most fundamental division of the Greek dialects is that into the West Greek and the East Greek dialects, the terms referring to their location prior to the great migrations. 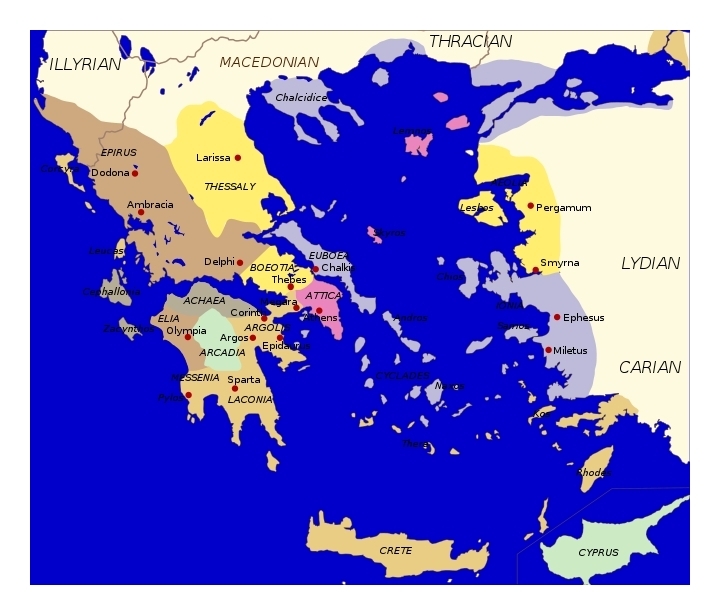 The East Greek are the “the old Hellenic” dialects, that is, those employed by the peoples who held the stage almost exclusively in the period represented by the Homeric poems, when the West Greek peoples remained in obscurity in the northwest. To the East Greek belong the Attic and Aeolic groups... passim... And to the East Greek (dialects) also belong the Arcado-Cyprian.” And, of course, just to be certain we have the whole picture clearly in focus, we must also include Mycenaean Greek and early Arcadian as proto-Ionic, both of which dialects held sway “prior to the great migrations.” Here C.D. Buck is referring specifically to the great Doric invasion of the Greek peninsula ca. 1200-1100 BCE or thereabouts. 1. The division between the East Greek dialects, among which we count the Arcado-Cypriot (subsumed by its slightly different Arcadian and Cypriot variants) plus the Aeolic, Ionic and Attic dialects, as representative, there being others as well... and the West Greek dialects, under the generic, Doric, is clear and distinct. Never the twain shall meet. 2. Since Mycenaean, proto-Arcado-Cypriot and its later metamorphoses, Arcadian and Cypriot, are all in the same dialectical class, i.e. East Greek, any consideration of the function(s), historical rôle and influences of any and all of these dialects in particular play, must be decisively distinguished from the rôle the Doric dialects played, since the former were all firmly in place and fully operative all over the Greek peninsula well before the Doric invasions ca. 1200-1100 BCE. In fact, in the case of Mycenaean Greek, that dialect held sway for at least 300 years prior to the Doric invasions, so that any putative influence or impact of the latter on the former is de facto impossible. 3. The proto-Arcado-Cypriot dialect is clearly the younger cousin of Mycenaean Greek, as is its later evolution into literary Arcado-Cypriot (Arcadian/Cypriot) as found on the Idalion tablet (fifth century BCE). This fact alone serves to reinforce beyond a shadow of a doubt that Doric Greek could have had no influence on Mycenaean Greek any more than it did on Arcado-Cypriot, as both of the latter were, as C.D. Buck underlines, the “the old Hellenic” dialects. Thus, the intimate relationship between Mycenaean and Arcado-Cypriot doubly reinforces the total exclusion of Doric influences, however meagre. 4. It naturally follows from 3., as day follows night, that documents composed in Mycenaean Linear B and in Arcado-Cypriot Linear C are soundly ensconced in the framework of the very same class of ancient Greek dialects, the East Greek. Henceforth, in this blog, any discussion of the intimate relationship between the Mycenaean and Arcado-Cypriot dialects and of the application of their respective scripts, Linear B and Linear C is firmly set in the framework of this hypothesis, which bears extensive historical linguistic evidence mitigating strongly in its favour. A few final comments are in order with respect to the actual Linear B correlatives of Arcadian words in the vocabulary above. These observations revolve around the methodological process of cross-correlation between Arcadian documents, in this case in alphabetical Greek, with those in Linear B. 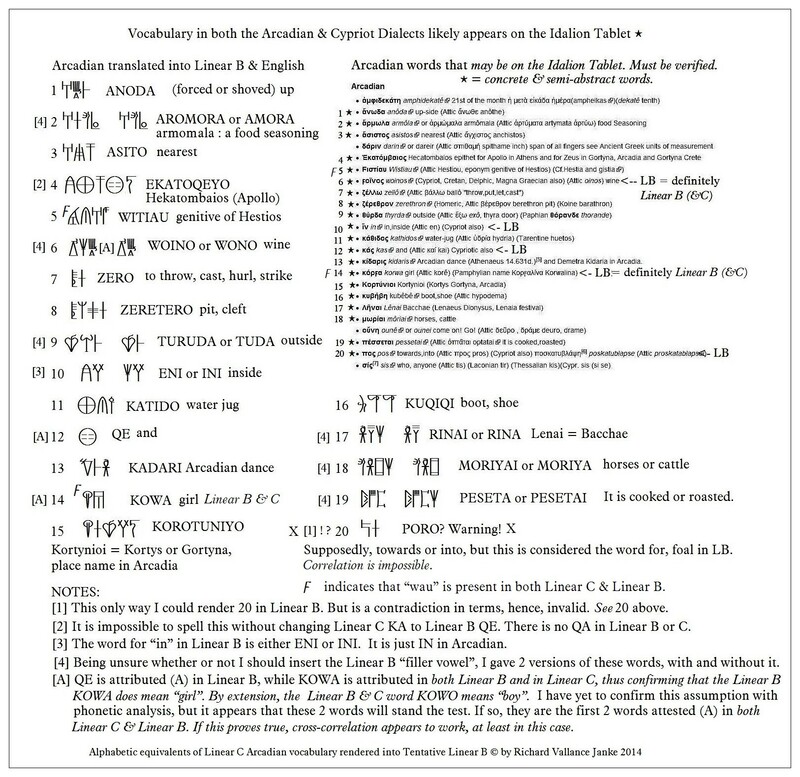 What we have already discovered, to our great astonishment and delight, even without taking the requisite step of a thorough methodology of cross-correlation, as discussed at length in our previous post on the relationship between Cypriot and Mycenaean Greek, is that at least one of the words in Linear B extracted from this vocabulary of Arcadian, and very probably two, are clearly and indisputably real attested (A) Linear B words. They are, of course, the Linear B for “and” (QE) and for “girl” (KOWA). By extension, we may as well add a third, “boy” KOWO, since it is simply the masculine of the former. 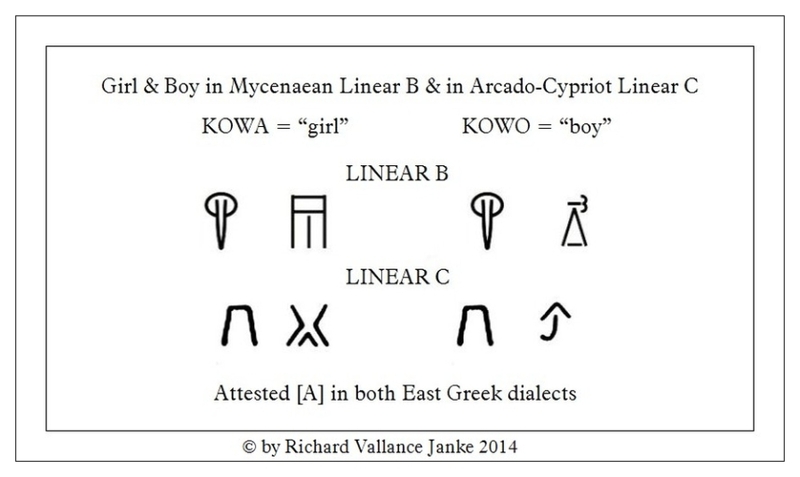 KOWA appears both in Linear B and in Linear C, and is therefore, by default, attested (A) in both. 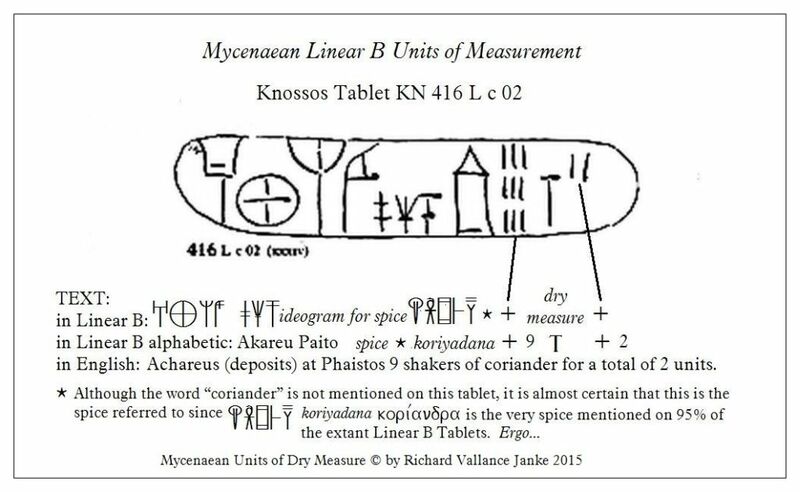 This is a rare jewel of a find, and to my mind, it is the very first instance of actual confirmation of any word in the vocabulary of Linear B & C common to Mycenaean and Arcado-Cypriot. This in effect constitutes our very first, albeit baby, step in the cross-correlation of Mycenaean and Arcado-Cypriot vocabulary by means of a tried-and-tested linguistic methodology. How many Mycenaean and Arcado-Cypriot will eventually (nearly) match up, whether scores, some or just a few, I cannot possibly predict right now. But it is certain that we shall eventually be able to compile at least a small vocabulary of equivalent Mycenaean & Arcado-Cypriot words, and as soon as we can (b), I shall be sure to let you know. Such a vocabulary will prove of inestimable value in going a long way to confirming attested Linear C = derivative Linear B words (ALC+DLB), as explained in the previous post. (a) Buck, C.D. The Greek Dialects. London: Bristol Classical Press, © 1955, 1998. ISBN 1-85399-566-8. xvi, 373 pp. (b) sometime in 2015 or at the latest, early 2016. First and Second Persons Singular of Athematic Verbs Fully Restored in Mycenaean Linear B! To my mind, this is a significant step forward in the genesis of a comprehensive Mycenaean Greek grammar, lending further weight to my hypothesis that archaic Greek conjugations seem to be virtually identical to their Mycenaean forerunners. But there is even more to this than first meets the eye. This is no mere happenstance. It confirms almost beyond a shadow of a doubt that certain verb conjugations and adjectival/nominal declensions in archaic (or Homeric) Greek were (almost) exactly the same as their predecessors in Mycenaean Greek some 400-700 years earlier. And the more archaic the alphabetic Greek grammatical form, the more likely it is that it will be (almost) identical to its Mycenaean “ancestor”. If confirmed, my hypothesis would be a real revelation! It would at least appear that Mycenaean Greek grammar changed very little over the 400 years after the fall of Mycenae itself in 1200 BCE to the first appearance of archaic alphabetical Greek around 800 BCE. If this is the case, it follows that we will be able to reconstruct a good deal more Mycenaean Greek grammar in Linear B than I had first imagined possible. However, a word of warning! I must test this hypothesis over and over with practical applications (paradigms) for as many categories of Mycenaean grammar as I can possibly survey and reconstruct, including above all else verb conjugations and nominal and adjectival declensions. If the results turn out to be as I presently project them in my busy-bee mind, the implications and ramifications for a truly comprehensive reconstructed grammar will be enormous, if not revolutionary. If nothing else, we may discover that there is a far greater affinity between grammar behind the Linear B syllabary and and that of archaic alphabetical Greek than we ever imagined to date. On the other hand, the affinity may be weaker than I imagine, hence, probably invalid. It will take me at least a year to carry this hypothesis to its “logical” outcome. In the meantime, I shall have to completely revise the complete conjugational tables for Athematic Verbs (present, future, imperfect, first & second aorist and perfect) I previously posted. These necessary revisions will affect both the Athematic conjugational tables and at least some of the text of that post. Which Greek Dialects are the Descendents of Mycenaean Greek? Allow me to cite at some length four authoritative sources for the close-knit relationship between Mycenaean Greek (ca. 1500-1200 BCE) and the East Greek dialects which sprang up later, spreading out, first to Arcadia itself, as the Arcado-Cypriot dialect, which then in turn spread westward to Cyprus in the period of the great Greek migrations through colonization (ca. 750-550 BCE), also northwards towards Ionia and Attica, and eastwards to the island of Lesbos and its environs (Aeolic). Arcado-Cypriot, as C.D. Buck states in his ground-breaking study, The Greek Dialects (University of Chicago Press, 1955; republished in 1998 by Bristol Classical Press, © 1998 – ISBN 1-85399-556-8. xvi, 373 pp. ), belongs to “The East Greek... Old Hellenic dialects, that is, those employed by the peoples who held the stage almost exclusively in the period represented by the Homeric poems, when the West Greek peoples remained in obscurity in in the northwest. To the East Greek division belong the Ionic and Aeolic groups.. [and].. also the Arcado-Cyprian.” Then he makes a point of stressing that “no two dialects, not even Attic and Ionic, belong together more obviously than do those of Arcadia and the distant Cyprus.” (pg. 7), and goes on to say, “There are, in fact, notable points of agreement between Arcado-Cypriot and Aeolic... which cannot be accidental.” (pg. 8, all italics mine). 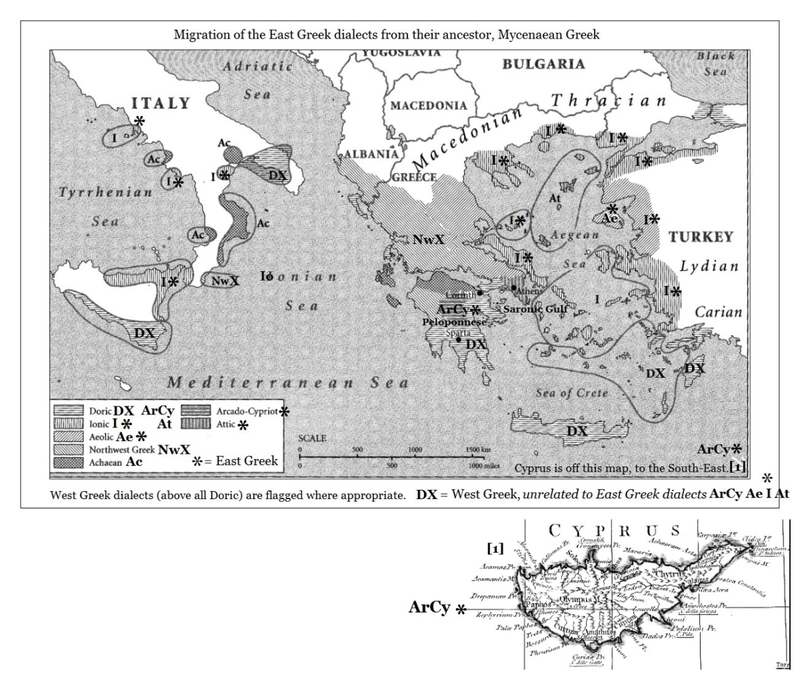 I have taken pains to quote all of these observations to make it abundantly clear that following dialects, Mycenaean, Arcado-Cypriot, Attic-Ionic, Aeolic and Lesbian, are all East Greek dialects, as illustrated by his table on page 9, as opposed to the West & North-West Greek dialects, which include all of the Doric dialects, such as Argolic, Megarian, Cretan etc. 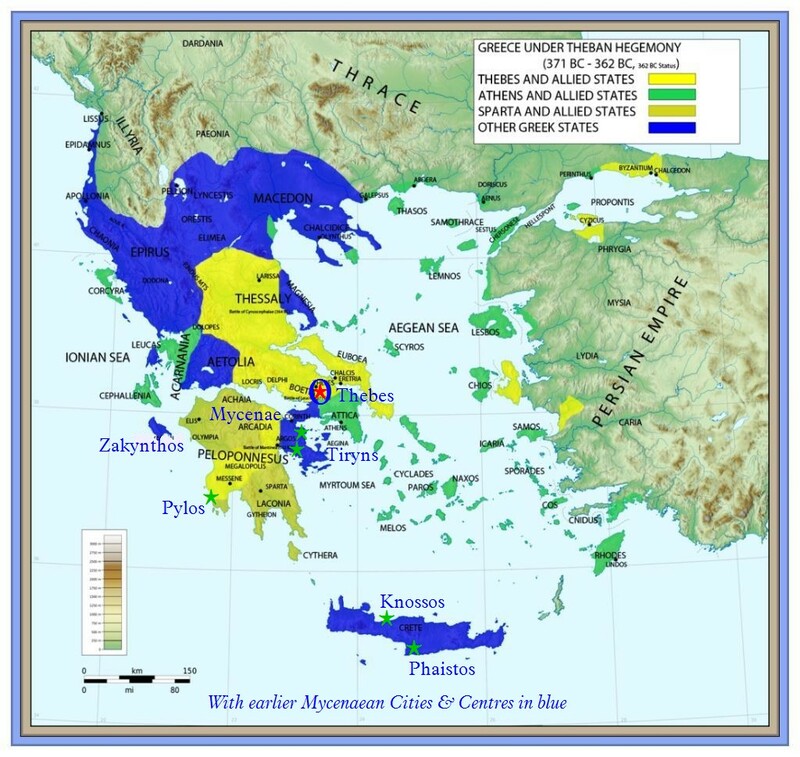 2  All of the East Greek dialects migrated from their original home base during the great age of Greek colonization (ca. 750-550 BCE), as witnessed by the spread of the Arcadian dialect to Cyprus in the historical period, and of Attic-Ionic eastwards as Aeolic towards Lesbos and its environs. 3 these patterns of migration of the East Greek dialects were paralleled by the migration of the West Greek dialects to colonies as prosperous and large as the great city of Syracuse (Doric) and other Greek cities along the west coast of Italy. 4  Confirmation of Denys Page’s “new theory” (1966) has been re-affirmed and validated over and over again all the way through to the present day (Cf. Woodward, 2008 & Bakker, 2010), so that there remains little doubt, if any, that his  “new theory”, which is no longer new at all, having persisted a half century, is here to stay. Mycenaean Greek, which was written in the Linear B syllabary, and Arcado-Cypriot, which used the Linear C syllabary, both belong to the family of East Greek dialects, which were to spread from these two into Ionic-Attic and Aeolic during the period of Greek colonization (ca. 750-550 BCE). For more on this, see the next post, “Which Greek dialects of Mycenaean Greek”? What is the Relationship between Mycenaean Greek & Arcado-Cypriot? … there is a lot more to this than meets the eye! What is the Relationship between Mycenaean Greek & Arcado-Cypriot? ... there is a lot more to this than meets the eye! My basic premise is this, that since Arcado-Cypriot (written in the syllabary Linear C) subsisted all the way through from ca 1100 BCE to ca 400 BCE (700 years! ), before the Arcado-Cypriots, i.e. Arcadians, finally caved in to alphabetic Hellenistic Greek, otherwise known as “koine” (the common language), in the face of its otherwise universal use, is without a shadow of a doubt the ancient Greek dialect most closely related to Mycenaean Greek (written in the syllabary Linear B), being for all intents and purposes its younger cousin, it must logically follow that Mycenaean Greek must be Greek and nothing but Greek. The really peculiar notion held by a tiny minority of self-appointed high-minded “researchers” that Mycenaean is not Greek, and that Michael Ventris, as brilliant and methodologically logical as he was to a fault, was merely “making clever guesses as to what the language was, truly boggles the mind. It intend to establish once-and-for-all that such silly notions are not only specious in the extreme, but entirely tautological. The mere fact that the two dialects share a virtually common grammar and vocabulary is enough to lay the myth that Mycenaean Greek is not Greek to rest forever. For if it is not Greek, then what on earth is it? And if such researchers are so clever (and apparently brighter than a genius of Ventris' stature), then they ought to have long since been able to decipher whatever the blazes they imagine it is. But they have not, and I wager my life they never will. 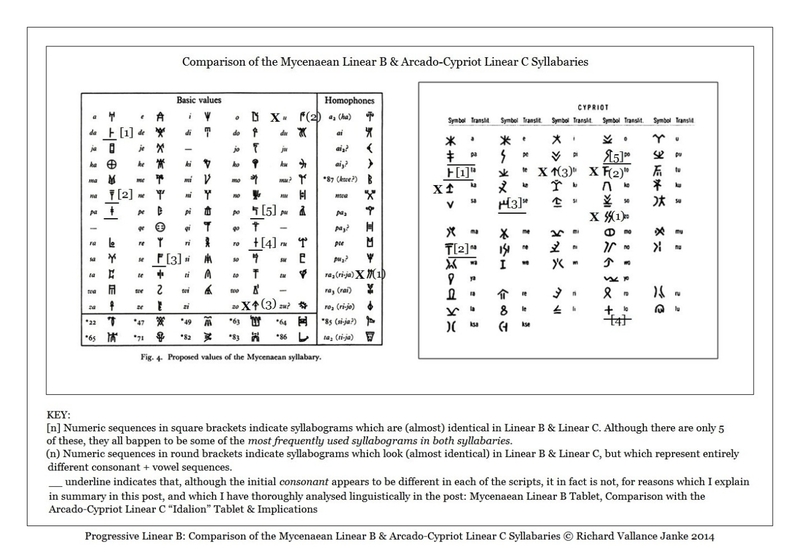 To this end, I will also master Linear C this year, and subsequently translate the entire Idalion Tablet (the longest text by far composed in Linear C) into English, with the view to cross-correlating Arcado-Cypriot and Mycenaean down to the most fundamental level, by reconstructing the grammar and vocabulary of both dialects to the greatest possible extent that I can. And I shall. The next post displays Idalion Tablet.